Monopoly Dream Life is a 5-reel, 20 pay line slots game that enables you to get a taste of the millionaire lifestyle from the comfort of your own PC. Your guide through this virtual experience is MR MONOPOLY himself, and if you spin the right symbols on the right reels at the right time you could win yourself a real-world fortune. This game is from the same IGT stable that brought us other Monopoly branded titles, including Monopoly On a Roll, so you can expect superb graphics and animations, rich audio and more excitement than you can shake a rather elegant cane at! Playing Monopoly Dream Life is simple. All pay lines are always active, so you only need to choose the size of your stake per line. You can bet as little as £1 per line or as much as £200 per line, and when you have selected your stake via the Line Bet controls at the foot of the screen you can click the green GO symbol to set the reels in motion. Prizes are won in the main game by getting various symbols to match up on any given pay line. Click the VIEW PAYTABLE button and you will see the full range of winning symbols, which include some of the most popular Monopoly playing pieces (the dog, ship and top hat), a WILD symbol, a BONUS symbol and various scenes showing MR MONOPOLY indulging in some of his favourite leisure activities. The more valuable the symbols you match on a pay line, the more you win, with up to 5,000 times your Line Bet up for grabs! Whenever you spin a winning combination of symbols, a Freefall feature is activated. This removes the winning symbols from the reels and allows the remaining symbols to drop down into the spaces that have been freed up. The spaces that are at the top of the reels are then filled with new symbols falling from above. All of this Freefall activity can help you win several times from a single spin, boosting your bank balance in the process. 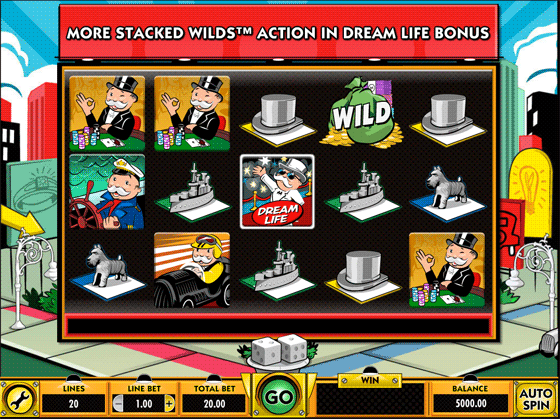 The jewel in the crown of the Monopoly Dream Life slots title is the Dream Line Bonus game. This is triggered by getting three BONUS symbols on a single pay line, and it begins with you riding an elevator up to MR MONOPOLY's penthouse suite. Once there, you will be able to pick 4 face-down Property Cards from a total of 16. Your cards will earn you free spins, with up to 16 free spins available in a single Bonus round. Even better, the free spins reels will be loaded with more stacked WILD symbols than would be the case in the main game, giving you even more ways to win big!